Peacefully at the Victoria Retirement Living on Tuesday February 5th, 2019 in his 88th year. 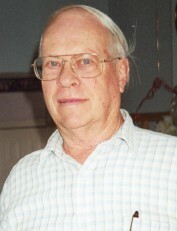 Beloved father of Wayne Thompson, Gord Thompson (Linda) and the late Gary (Laura) Thompson. Loving grandfather of Scott and Kella. Dear brother of Douglas Thompson, David Thompson and the late Harry Thompson and Marjorie Chisholm. Fondly remembered by many nieces, nephews and cousins. Friends are invited to call at the MacCoubrey Funeral Home, 30 King St., E., Cobourg on Saturday February 9th, 2019 from 1-2 pm., followed by a service at 2 pm. Cremation with interment in Colborne Union Cemetery in the spring. If desired donations may be made to the Canadian Cancer Society. Condolences received at www.MacCoubrey.com. Saturday February 9, 1 - 2 p.m.
Saturday February 9, 2 p.m.